"Got it." Demyx replied and faded away briefly only to appear before the injured swordsman, his dancers behind him. He smiled at said warrior, Arpeggio manifesting herself once more. "We didn't get to introduce ourselves properly earlier. I'm Demyx, Number IX of Organization XIII and this is Peggy." the Nocturne said politely. "We could do this the easy way and you could just surrender your heart to the Superior or we could do it the hard way and then I'd have to take it by force." Demyx stated with a frown as he leaned on Peggy's neck. "You'd be doing me a big favor by saving me the hard work." "Micaiah, I'm glad I can use you're assistance." "Of course, as the light sage I will," She said, she made a light sheild form around Eliwood, then healed him using her 'sacrifice' ability. She then looked at Demyx, "As the guardrian of the place, I suggest you leave, ridding of the disturbance. As a spirit I do not have any power which you could take from me, but I can use power to help those who have made a pact with me." "Now then...you wanted a battle?" Sora rushed to Eliwood's side. "Tell me where he took Kairi!" he snapped at Demyx, ready for a fight. The Nocturne gave Elliwood and Micaiah a look between confused, angry and impressed. "Awww man. I was really hoping I wouldn't have to do any hard work...." the musician stated still grumbling under his breath about how lucky the elder male was. When he heard the Keyblade Wielders voice he gave a lopsided grin. Choosing to tease the boy he shrugged his shoulders before stating in a sing song voice. 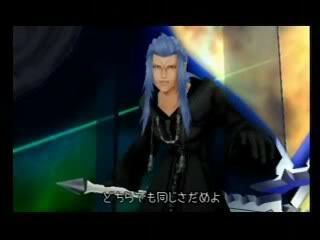 "I don't know where Saix took your girlfriend. And even if I did I wouldn't tell you~!" Xemnas smiled a bit when Saix reappeared with Kairi over his shoulder, "Good, now we have a keyblade and I can put my plan into action." He smirked evilly, nudging the girl awake but putting one of energy drains on her. Saix set her down, "Wake up girl, the Superior needs your attention." He frowned, looking towards the sky, "I hope Demyx is okay...."
"Get out of my country. Now. Or I will banish you." "Thani!" She said, as a orb made of pure light was shaped around Demyx, it wouldn't release him. It couldn't be broken from the inside or out, "Perhaps we can get some information now." He watched as the silver headed girl did something that surrounded him in light. The blond felt a spike of panic rise inside him. Banging on the 'walls' of whatever he was bein held in and yelling, "Let me out! Ugh! It is NOT selfish! We didn't ask for our hearts to be taken! We just want them back and we'll do whatever it takes to do that!" Tears brimmed his eyes now, his struggling upsetting him further. "You say we're selfish, but why would you do something like that, waste a perfectly good heart just so we don't get it?! Wouldn't that be just as selfish?" He gripped Arpeggio and strummed on her chords wih reckless abandon, all the while keeping his watery gaze on Eliwood. "Dancers attack!!!" He shouted, a handful went after the girl as the rest charged at the swordsman whose heart was so sought after by his Superior. "It gives you no right to steal something that belongs to others. It is a crime, a crime that will punished for," He said firmly, "It is not a selfish act if I myself take my heart to the grave. It belongs to me, and you have no right to try and steal it for you're own gain." Eliwood wasn't worried about the dancers at Micaiah. he knew she could handle herself well. He held up his rapier, then swung a 360 attacked, causing all of the dancers around him to be knocked back. "Why is it that you have to have his in particular. Tell me why." Dazedly, Kairi opened her eyes. She glanced between Xemnas and Saix for a moment, not quite comprehending the situation, then realization struck. She tried to fight away, but was too weak to do so. "What do you want?" she snapped, but her voice was shallow, tired. Sora sliced through all the dancers. His rage was fueling his strength. Okay, not the brightest idea, opening himself up to the Heartless and darkness like that, but he was royally pissed. "Tell me where Kairi is, or I'll... I'll..." Sora couldn't think of anything horrible enough, so he went with something he'd heard in an old gangster movie on the island, "or I'll crush them, smash them, and cut them off!" 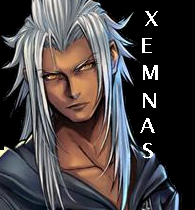 Xemnas leaned down infront of her face, "Are you angry? Do you want to harm me, then please try, I doubt a useless keyblade like yours could damage me." Saix got a cold feeling in his gut, like something was wrong, his instincts were going haywire, "Superior, I'm going to check on Demyx." He portalled to a nearby building and saw Demyx trapped, he snarled. He hurled his Claymore at the girl using the spell. Kairi drew her Keyblade and wobbled to her feet. She had to beat him, or at least harm him enough so she could get back and help Sora. She wouldn't need to be saved again. She rushed at him, swinging her blade to catch Xemnas in the middle. He easily dodged, frustrating her. "Firgaga!" but she was too weak to cast the spell. In another attempt to hit Xemnas, her legs gave out on her and she collapsed to all fours. Xemnas smirked, he picked up her up by her keyblade and it disappeared, a new keyblade appeared in his hands, Xehanort's old keyblade, one made of darkness, he cackled evilly. Kairi's eyes widened. "How did you?!" Xemnas laughed, "So it seems I never needed the boy, I always had the ability, I merely forgot it along with all the other things." He grinned, the keyblade glowed a little. He thought for a moment, "I shall call you, Eternal Nothingness" He looked at Kairi with a menacing look, "You are no longer of use to me." Kairi struggled to her feet once more. "I'm not going to lose to you," she panted, readying a fighting stance. "I won't lose." Xemnas chuckled, smirking at the girl, "Oh? Then try me." He readied his weapon and took a fighting stance. He ran towards her in a serpentine motion. Kairi charged as well. She swung her Keyblade, hopefully catching Xemnas in the stomach. The blond fell to his knees in disbelief. All of his Dancers, his girls, they were all destroyed, every last one of them. He tried to focus through his teary eyes, the sound of both Sora and the silver headed female talking at once only serving to confuse him more. They were asking questions, that much he knew. So many questions, all at once, and all that he did hear was a jumbled mess. "AAAAH! I DON'T KNOW WHY!!! STOP ASKING ME ALL THESE QUESTIONS!! !LET ME OUTTA HE--" He was cut off mid-rant when he saw the Claymore hit Micaiah, breaking her hold on him simoultaneously. The Nocturne fell to his knees in disbelief. Saix... The blunette had come back for him.He was saving him...again. A warm feeling spread throughout the blond's chest before he passed out. His leg, still bleeding under his coat from the Princess of Heart's earlier spell, being the cause. He'd lost quite a bit of blood already. The keyblade cut his cloak and gave him a shallow cut as he backflipped over her and shot a few balls of dark energy with his other hand. Saix growled, he jumped and landed next to the Noturne. He whined softly, stroking the hair out of his face, "Demyx." He snarled at the others. Sora raised his Keyblade to Saix. "Tell me what you've done with Kairi!" he shouted at Saix. "If you don't, I'll kill you both." Under normal cercumstances, what he said would frighten him, but he was too angry to care that he was starting to sound like Riku while he was with the Heartless. 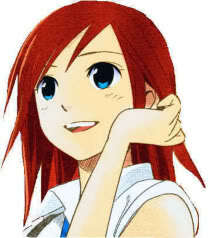 The dark projectile hit Kairi square in the back, knocking her foreward flat on the ground. She tried to get up, but the screaming pain was too much, and she fell again, unconcious. "I won't hold back now." He said, his power level rising. Micaiah wasn't affected by Saix's weapon, being a spirit it didn't wound her, however it still gave her a heart attack, so her spell broke as she flinched, even after being hit. She stood up straight and was considering to do something, but she noticed Eliwood's attack was becoming more and more steady. His attacks were fast and accurate. She wasn't needed at the moment. Xemnas snorted over the figure and leaned down, putting seals on her limbs, he summoned a shadow heartless. Saix roared, the sound becoming a sonic boom-ish effect. His hair thickened, going crazy and wild. His eyes lost their pupils and turned to a solid glowing gold. His claws and nails lengthened, "YOU WILL NOT TOUCH HIM!!!" He went absolutely berserk and charged at Eliwood and Sora, not dodging any attacks, just going completely ballistic. It was all Sora could do to block the attacks. "We won't hurt Demyx if you tell us where Kairi is! We'll let you both just leave!" Nothing was getting through to the beserker. 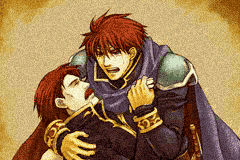 "Eliwood! Do something!" Xemnas sneered, "Do I have to kill you the old-fashioned way?" He cracked his knuckles, "Strangling should do it." "Don't move," He said in a serious tone, "Calm down. Listen. This one will live if you listen."